Being able to have a private bathroom without leaving the bedroom is one of the trends we can find today, it is almost like a small luxury. Betting on ensuite bathrooms is more than a trend; it will make the most of both the available space and natural light. To create a space like these, people’s needs and intimacy should not be neglected, so barriers must be taken into account. They can be as simple as a partition and a door, but the most current trend is that they fit correctly in the room can blend in with the surroundings or blur, incorporating into the decoration of the room. Anyone can count on your home with a proposal such as these, with a fairly large room or with the removal of the partition of an adjacent room and making reform to set up that space to create a bathroom en suite. In many occasions we will have seen consistent proposals in the separation of spaces with glazed panels, screens or doors, achieving independence in both environments. It does not always have to be this way. With the placement of a half-height open partition, many aspects of the bathroom can be visually concealed, providing a great style and intimacy. Another resource with which to gain meters in this merger of rooms is with the placement of sliding doors. 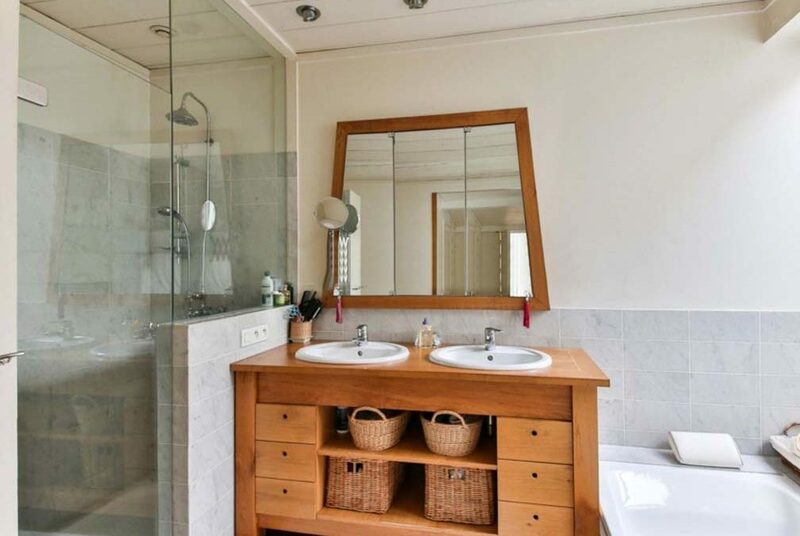 You can bet on alternatives of shower trays with screen and eliminate the bathtub to make the most of the space. If you have enough space in the bathroom you can keep all the elements, redistributing them for maximum comfort. Other current trends for the bathroom are non-slip stoneware, minimalist and functional decoration, light colors and also natural textures, a correct placement of the different points of light and also a diffused barrier between room and bathroom.